You must make reservations at least 5 minutes in advance of the time at Ellicott Mills Brewing Company. Large parties of 10 or more please give us a call. Nestled in the heart of Historic Ellicott City, Ellicott Mills Brewing Co. offers the Finest Food & the Finest Beer in one of the most beautiful historic districts in the state of Maryland. Brewing is a time honored art form. Our aim is simple: to craft a clean and smooth tasting draught using the most authentic methods and ingredients available from around the globe. 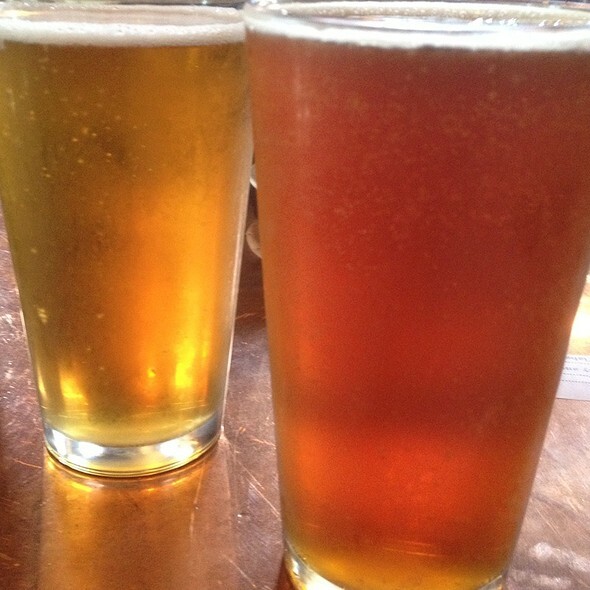 Ellicott Mills Brewing Co. is much more than a brewery though, we are a dining experience. The executive chef/owner combines American Grill and an eclectic cuisine with a European accent. With the combination of the Finest Food & the Finest Beer, we have established the East Coast's premiere restaurant-brewery. Online reservations are not allowed for bar seating, thanks. Chicken and shrimp salads served over a bed of fresh greens with tomato, egg, and cucumber. 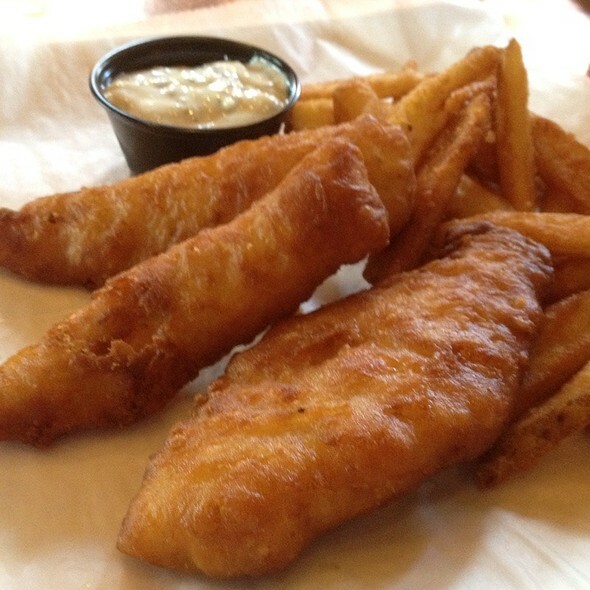 Battered rock fish fillets deep fried until golden brown. served with a sweet and spicy thai chili sauce. Crispy fried dumplings with pork, scallion, and vegetables, served with a sweet and spicy thai chili sauce. Blue crab meat with artichoke hearts blended in a creamy cheese dip and served warm in a bread bowl. 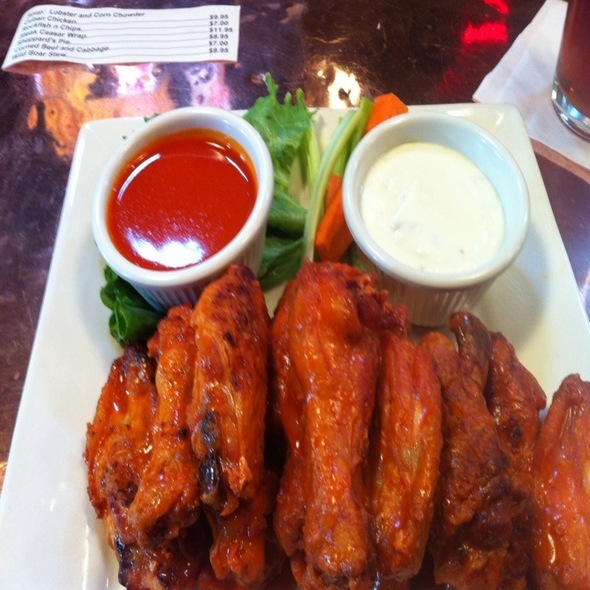 A brewery favorite served with bleu cheese dressing. Your choice of two: bockwurst, bratwurst, wiener wurst or venison sausage all venison. 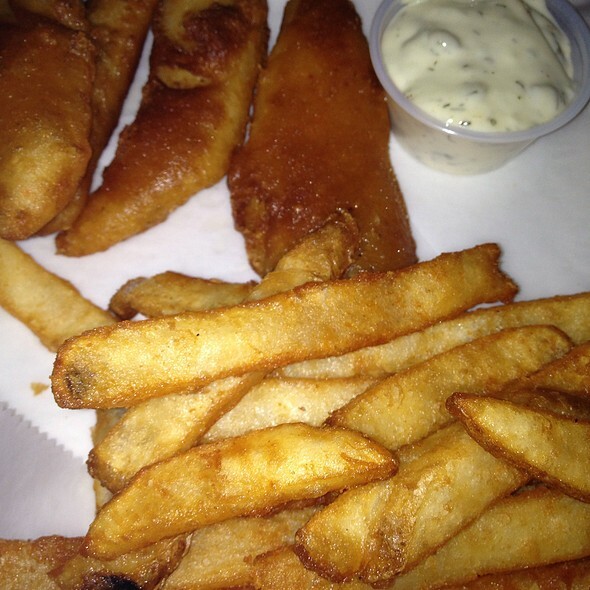 Crispy chicken filets deep fried and served with honey mustard. Sashimi grade seared rare served with soy sauce, wasabi and ginger. Your choice of two: bockwurst, bratwurst, wienerwurst or venison sausage all venison. Served in a bread bowl with melted cheddar cheese. A different creation of the freshest daily ingredients. Lightly floured, quickly fried and served with marinara sauce. Five large shrimp dipped in a coconut batter. deep fried and served with a spicy thai chili sauce. Alligator tail saut ed creole style served over a bed of rice. Soft ripened brie wrapped in a puff pastry served with melba sauce. Basket of three freshly baked soft pretzel sticks with mustard. Julienne grilled chicken breast mandarin oranges and dried cranberries, served on a bed of fresh greens with tomato, red onion, and cucumber. served with a raspberry walnut vinaigrette. Ripe avocado filled with your choice of chicken or shrimp salad, on a bed of fresh greens with tomato, egg, and cucumber. Meat, Chicken, Shrimp Salad. Baby shrimp and lump crab served on a bed of fresh greens with tomato, egg, cucumber and red onion. Julienne grilled chicken breast with black olives, feta cheese, tomato, egg and red onion served on a bed of fresh greens. served with a lemon olive oil dressing. Fresh sashimi grade tuna grilled, served on a bed of fresh garden greens with tomato, egg, red onion and cucumber. A bed of fresh greens with tomato and cucumber. Dressing: Raspberry Walnut Vinaigrette, Parmesan Peppercorn, Olive Oil and Lemon Herb, Honey Mustard, Bleu Cheese, Ranch. Side: Fresh Vegetable Selection $2 Rice Pilaf $2 Garlic Mashed Red Potato $2 Brew City Fries $2 Fresh Old Bay Potato Chips $2 Housemade Cole Slaw $2. Venison sausage, bratwurst, bockwurst and wiener wurst served with red cabbage. Marinated in beer, slow roasted and served with our tangy beer bbq sauce. Twin thick cut smoked pork chops. a bavarian tradition. Colossal beer battered shrimp deep fried until golden brown and served with cocktail sauce. Twin blue crab cakes made with lump and back fin. broiled until golden brown. Boneless chicken breast topped with lump crabmeat and sherry old bay cream sauce. Grilled delmonico steak paired with a jumbo lump crabcake. Lime and cilantro marinated chicken breast dusted with caribbean jerk seasoning, then grilled and topped with a remoulade sauce. Broiled in lemon and orange juice with a spicy rub of chili powder, garlic, and brown sugar. Sweet sea scallops sauteed with red onion, garlic, mushroom, and sundried tomato, in a marsala cream sauce. Pan fried with scallions and de;glazed with beer in a rich brown sauce. Strips of cajun blackened angus steak over penne pasta with a tomato, mushroom, gorgonzola cream sauce. Battered rock fish fillets deep fried until golden brown and served with a sweet and spicy thai chili sauce. Pork loin cutlets sauteed with mushrooms and tomatoes in a white wine brown sauce. Sauteed shrimp, chicken, and andouille sausage with tomatoes, peppers, and spicy penne pasta. 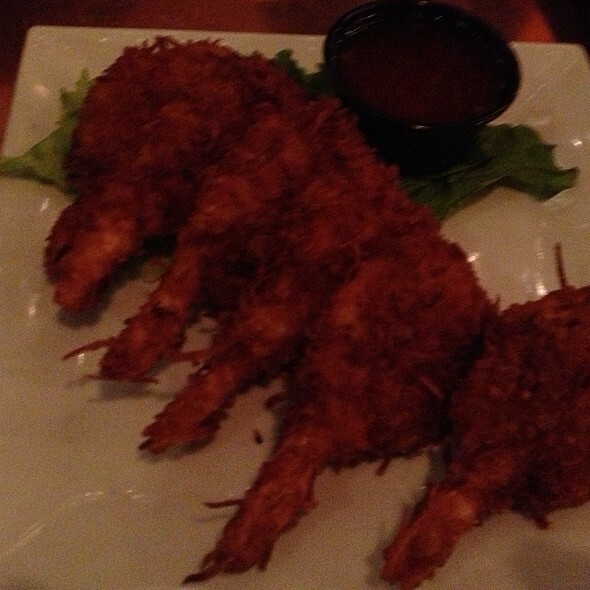 Large shrimp coated with toasted coconut and fried to golden brown. served with spicy thai chili sauce. Pan seared n.y. strip topped with chimichurri; onion, parsley, virgin olive oil, lime juice, and fire roasted red peppers. Side: Croissant for $1.5, Pretzel Roll for $1.5, Ciabatta Roll $1.5, Croissant for $1.5, Pretzel Roll for $1.5, Ciabatta Roll for $1.5, Except Croissant Club for $1.5, Except Croissant Club for $1.5, Except Croissant Club for $1.5, Vegetarian Wrap for $1.5. Choice of either shrimp or chicken salad lettuce, tomato, mayo, and red onion. Side: Chicken Shrimp Salad Either Shrimp Chicken Salad Lettuce Tomato Mayo Red Onion. A garlic herb tortilla wrap filled with swiss cheese, avocado, tomato, lettuce and red onion. served with asian sesame dressing. Chicken breast, bacon, swiss cheese, avocado, lettuce, tomato, mayo, and red onion. served on a freshly baked croissant. A plump blue crab cake made with lump and back fin. served with lettuce, tomato, red onion and tartar sauce. A brewery classic. a hearty portion of lean ground beef chargrilled and served with lettuce, tomato, and red onion. Half pound of lean ground bison. Large marinated mushroom char grilled and served with avocado, onion, lettuce and tomato. Breast of chicken chargrilled and topped with cheddar cheese, bacon and bbq . served with lettuce, tomato and red onion. Sashimi grade tuna steak grilled and served with lettuce, tomato, red onion and tartar sauce. 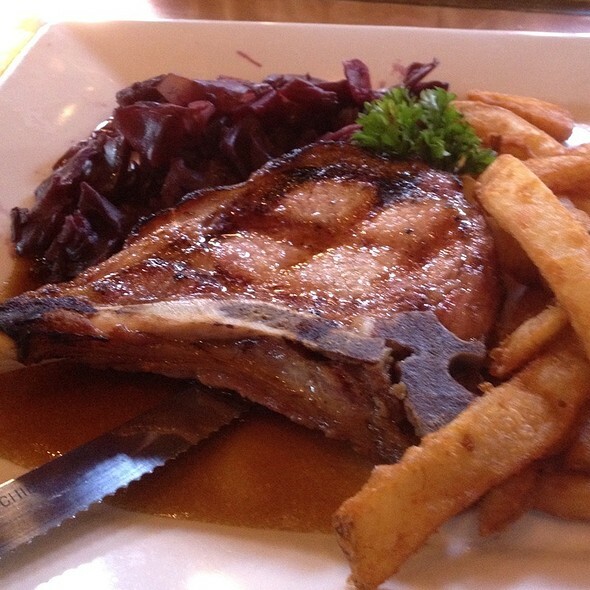 One of our thick cut, smoked pork chops served with red cabbage and fries. (not a sandwich). Tender pulled pork on a kaiser roll with smoky bbq sauce. An english cut of ribeye steak grilled to order. served with lettuce tomato and raw onion. Fresh ground sumatran beans regular or decaffeinated. Creamy, rich cheese cake water baked in the new york tradition. Florida key limes create a zesty cream filling in a crust made with pecans, graham cracker crumbs, cocoa and cinnamon. Reese's cup and peanut butter chips baked into a pie. Crispy fried tortilla with banana cheesecake mousse, rolled in cinnamon sugar. served warm. A variety of fine desserts to tempt your palate. Children 12 and under served with chips and a beverage. Alligator tail sautéed creole style served over a bed of rice. The beer flight was outstanding and the food very good! Beautiful exposed brick building with nice wood working inside! Will definitely be back. Food was not as good as last time. Had to send it back to heat up. Upstairs dining room is a great space. Our experience was just meh. It was evening, but the candle/lamps on the tables were not lit and we needed to use a flashlight on our phone to read the menu. My steak sandwich was ordered "medium", but the steak was way overcooked. The taste was good, however. But the rest of the food was nothing to write home about. Food, as always, was very good but the service was terrible. Had to constantly call for server to take our order & remind to bring water to table. Also appetizers not delivered to table before entrees. Always enjoy visiting Ellicott mills. We are big fans of the pumpkin beer, and the cinnamon sugar on the rim is a must. Always ask for the specials, as we find some real gems and favorites on this list which varies from visit to visit. A real family favorite! Excellent service. Good food. Good beer. Great for visiting with family. Quick service and delicious food in a quiet setting. Perfect for a date night or family dinner. Best rolls I’ve ever had. Brian is the best server I have had in a long time. The food was excellent, the scallops and shrimp on rice was delicious, the steamed shrimp were perfectly seasoned, and the ribeye steak was cooked as ordered and tender! 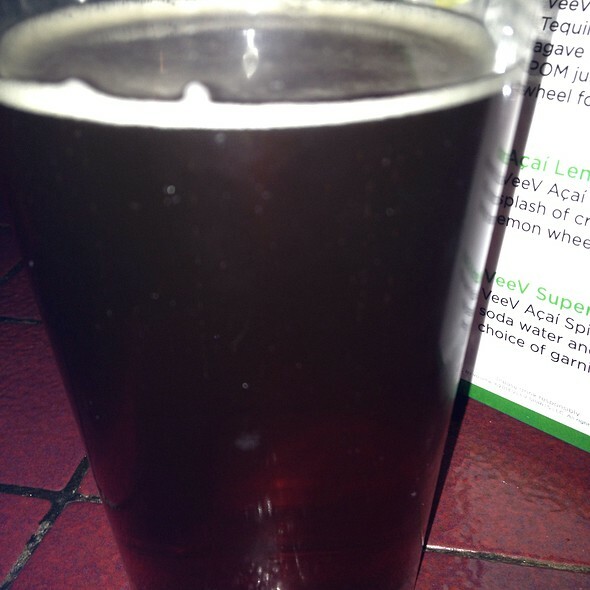 The dunkel bier is my favorite and did not disappoint. A great place for lunch, happy hour, and dinner. Fun celebration for us tonight. Wait staff was attentive but did not rush us. They were training a new person and it was a little longer but that was ok. Good was delicious and price was fair. Arriving late Sunday evening after a loooong drive from Chicago, our expectations were modest but we were treated as honored guests. The bartender/server/manager welcomed us enthusiastically and offered the full menu. Main courses ranged from fish to boar and venison. All were very good and reasonably priced. We shall return! The server was quite friendly and knowledgeable. Food came in a timely manner. There was an exuberant surprise party during our dinner. We asked to sit on the other side of the restaurant, but were told we couldn't because it was reserved. By the time we left > 90 min later, the quiet part of the restaurant was still empty. A toddler was allowed to run in circles inches from our table for ~20 minutes. The food was okay, but not worth what we paid. I would have gladly paid that price for excellent food, but it wasn't. All in all, a disappointing experiences. The place was a pleasant surprise. This was our first visit and we were celebrating my daughter's birthday. The food was very good and the menu presented a nice variety of dishes. I would recommend this for just about any occasion. I would suggest getting an table upstairs if you prefer things quiet and relaxing. The down stairs is more active and geared more for a nice drink or lunch with friends. Great first experience at Ellicott Mills Brewing Company. The menu has a lot of interesting selections. The food we ordered was good. Our server Tim was excellent. Only issue was with the temperature in the restaurant - it was very chilly - and the upstairs bathroom was a refrigerator. Great food and service! This is a hidden gem in Old Ellicott City! Looking forward to our next visit! It was a rainy/snowy night but we had a 6:30 reservation & the roads were perfectly fine so we headed out for our girls night dinner. Only to get there & the doors were locked! We could see customers inside eating but still had to call the restaurant to ask to be let in. Once inside we were greeted warmly but they said they had no reservation for us but since it wasn’t busy, there would be no problem seating us. In mentioned I had made the reservation via Open Table & someone (a manager possibly) stated they hadn’t checked that at all. That was a bit disturbing seeing as I use the Open Table app quite frequently. Once seated, our waitress was great. Very attentive & friendly. Of course, we were her only table but nonetheless, we were happy. Food was okay, not great. The crab dip was delicious! I had the club croissant & my girlfriends had the Neptune salad, shrimp salad sandwich & the MD style lobster roll. None of that was anything to write home about. The ambiance was very nice and all in all we enjoyed our evening. Beer was fantastic! The menu had lots of odd things like boar and alligator, but wasnt as good as the beer! Excellent place for lunch or dinner. Fun atmosphere. Excellent pub food. 2nd time we ate here. When making this reservation, I had thought it would be a hip, historic brewery for happy hour with my fiends. Upon arrival it was found to be a run down, average restaurant. The menus were plastic and sticky, the food was fine (though nothing special) and the beer options were lack luster. Overall the experience was average but nothing special and I will likely not return. We really enjoyed the beer selection. We had a flight and the beer was really good. The food was good as well. The bison burger was delicious. 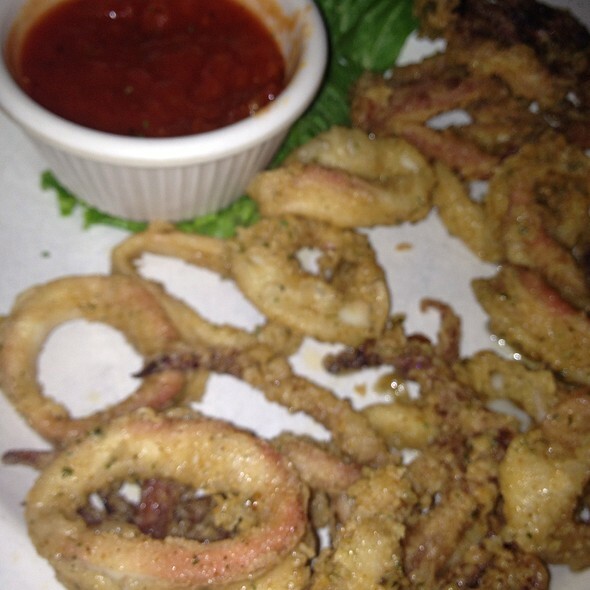 The calamari special was delicious as well. A group of four, we all enjoyed the food. I particularly enjoyed the Jagers Schnitzel - pork chops were extremely tender, with a rich, tasty sauce. I had the beer sampler - generous portions of four craft draft beers. Food was eh. We really love the place, and it has so much potential. We came in New Year’s Eve for dinner and the place was empty. They were out of some of the specials. And the waiter seemed to be in a big hurry. I’m not sure we will be back. Ellicott Mills Brewing Company accomodated our party of 7. They had an extensive offering of specials. I ordered the BALT+more sandwich (bacon, avocado, lettuce, tomato, and a crabcake on ciabatta) off the specials menu. It was fairly good, but the ciabatta made it a bit dry. My husband ordered the jambalaya -- one of Ellicott Mills Brewing Company's best dishes. He loved it. We ordered the thai chili calamari from the specials menu -- it was excellent! The crab dip was also very good and it was served in a sourdough bread bowl. My mother ordered the scallops from the specials menu and said it was bland. My brother ordered the steak and crabcake and said it was average. Their beer selection was a good seasonal and traditional German selection. Although I like the decor and our waiter was very nice, the food and beer were just okay. The prices were decent, but my mom ordered the Lemon Basil Shrimp & Scallop special (which was kind of pricey), and when it came out it tasted like nothing but salt and pepper had been used. We even asked the server if the kitchen forgot a lemon basil sauce on top, but they didn't. I was disappointed with the food overall. I might go back for a quick drink, but not to eat. Our family had a very nice lunch. The beer was tasty and the food was inspired and delicious. A nice overall evening. We enjoyed the ambiance and the food. Thank you. I reserved a table for birthday celebration. However, I was never asked who's birthday it was and was never offered even a sample "small size" birthday cake with atleast "1 candle" to the birthday girl. Such a gesture would have been greatly appreciated! The website requests information for specific celebration. So, I was expecting there would have been a "special small birthday offering". Chose Ellicott mills for dinner prior to Midnight Madness in Ellicott City. The town was packed and the restaurant was busy, but our service did not suffer in the slightest. Our sever Sara was outstanding! Attentive, helpful with decisions, and an awesome attitude. Food was great and beer delicious. This was our first dining experience and we will be back often. Food was very good, EXCEPT the red cabbage was NOT. The recipe needs to be improved very much so. Being German it was NOT good. Lobster night but no lobsters available. Disappointing. The rack of ribs and beer-battered rockfish were delicious, as well as the featured sides and Reeses peanut butter pie. Our server threw us a curve when he asked if he could bring us water, so we had to ask for beer and wine. Slightly disappointed that we didn't receive a Happy Anniversary acknowledgement. A good spot for food n drinks in Ellicott City . Service was great! Very good meal. Free beer for dads' made it even better. We started our meal with the pretzels and added the crab dip, absolutely delicious. I had the sausage plate, all 4 styles of sausage were great. My wife had the jagreschnitzel which was really good.